We’re looking for your favorite images of you and Fearless Girl! 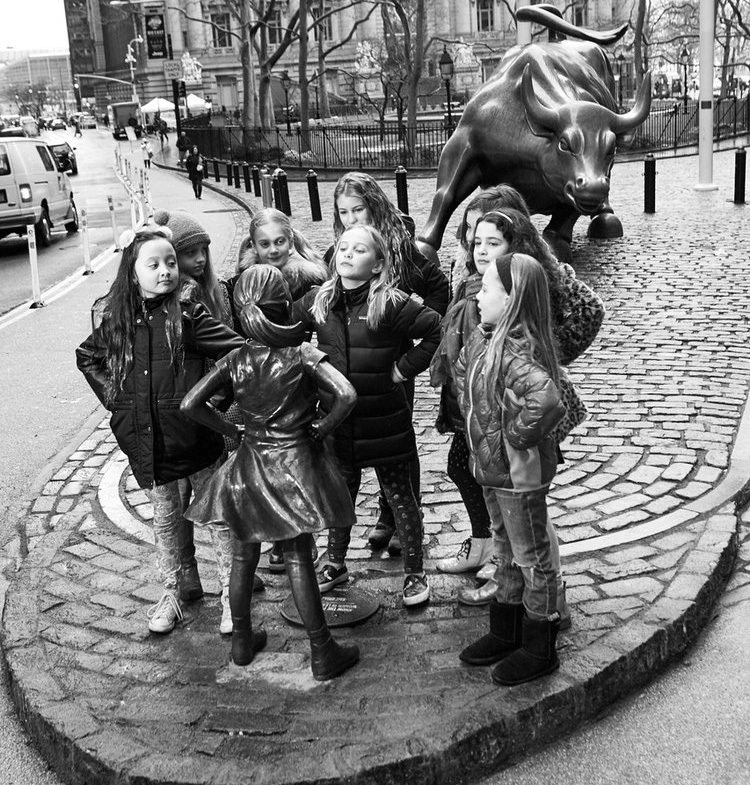 Please send your favorite Fearless Girl image, a one or two sentence statement about why you think Fearless Girl is important and your consent to use the image on the website to fearlessgirlus@gmail.com. The Day Of The Girl Child observance and those who celebrate it narrow the gender gap through research which isolate challenges young women still face today. By establishing programs which empower young girls, this event cultivates future leaders. Discrimination, at times subtle and at other times blatant, is minimized through awareness. We cannot protect our fellow human beings from abuse if we do not know what is happening all around us every day. Issues such as poverty, inferior education, health, child marriage, social and political discrimination and early motherhood rob many young women of the opportunity to participate fully and to impact policy decisions which affect them. The International Day Of The Girl Child brings key girl advocates together to address these issues and to affect change through education and opportunity while these girls are still young and impressionable. Studies show education as a key discrepancy between men and women in attaining corporate leadership positions, specifically the core STEAM curriculum of Science, Technology, Engineering, Art and Math. These key disciplines, prepare us to excel, innovate and affect decisions. The International Day Of The Girl Child provides a platform which empowers girls to lead. In fact, young women help to coordinate the event which serves them. Some are voted in as ambassadors of their respective countries in order to attend the global conference. On October 11th, Plan International’s Girls Takeover will celebrate the event by instituting over 200 “takeovers” in more than 50 countries. For one day, girls will assume important positions in politics, business and the media, including acting on behalf of the first female President of Nepal. Girls are charged with making at least one important decision and are able to experience, first hand, the role of leadership. Empowerment for our future. Education, holding work shops where boys and girls work in concert to forge effective decisions fosters respect and collaboration between the sexes and promotes conduct without discrimination. Leadership demands diversity and successful business cultivates it. The enlightened paths employs the multi-faceted approach to problem solving borne of a diverse business culture. The appearance of Fearless Girl, challenging the male dominant Wall Street financial community, brought gender inequities to light regarding salary and leadership. Gender diversity studies demonstrate diversity improves productivity, increases profits and enhances the work environment. Certainly, it is not a stretch to understand this same collaboration supports sustainable society. Day Of The Girl addresses the entire global community of women, over one billion of them, and studies analyze how and what can be done to realize equality and to maximize female contribution to society. Empowered young women help to structure a capable and prosperous world community. Unlearn prejudice and relearn collaboration. Our cultural evolution demands it. Most of us are uncomfortable with customs and practice we don’t understand. We all carry our own prejudice and unwittingly pass these biases on to impressionable youngsters around us. Prejudice is born of ignorance. Equality should begin with fair and just treatment in the home but, often these lofty ideals are left to educators to reinforce. Day Of The Girl facilitates this education, investing in half our global community to impart change for productive society. How do we cultivate an unbiased society where both men and women of all cultures can achieve their full potential? A lofty goal to be certain but, it begins with awareness. Discrimination prevents a sustainable, productive and healthy society. Day Of The Girl, a forum for research analysis, is the impetus of change for the good of girls. Finally, Day Of The Girl provides a vehicle through which we can bring young women of different cultures together, not to homogenize society but, to teach respect, to share ideas and to pull together for a greater good. Day Of The Girl highlights the issues of gender equality as a human right, the right each and every one of us has to be educated, to partake in policy decision which affects our lives, to contribute fully to the well-being of our global society and, finally, to lead if we are so inclined.